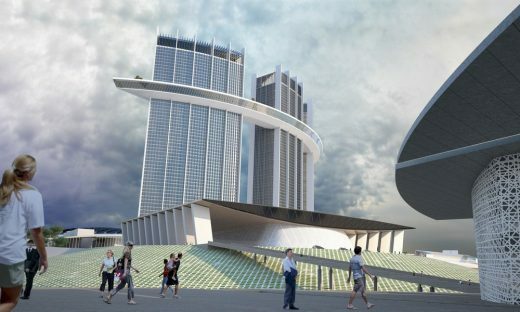 The overall project includes the construction of a 100,000sm convention and exhibition center, a 1,000-room business hotel, a 500-room five-star hotel, a 250-room youth hostel on 14.4ha with total floor area 189,216sm, an 11,000-seat sports complex, a 35,000-seat baseball stadium, an indoor gymnasium, a swimming pool, shops and restaurants, a museum and related facilities. Facilities will be developed in three phases. 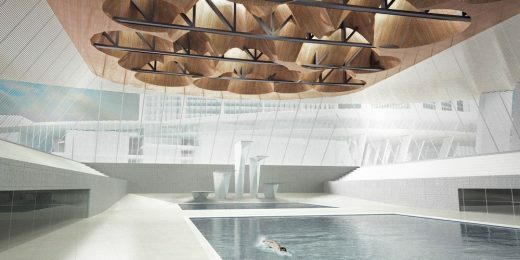 The first phase includes the removal of the student gym and swimming pool and the construction of two hotels, a sports complex comprising 11,000 seats, a swimming pool, an indoor gymnasium and a concert hall; the second phase includes the construction of a youth hostel and a secondary stadium, and the development of the area by the river; and the third phase includes the construction of an exhibition and convention center and related facilities. Construction on the first phase is expected to commence in 2019 and be completed by 2022. Second phase will be completed by 2023, while the third phase will be completed by 2025. Studio Niko Kapa were appointed as architects to formulate a master plan for the proposed development. 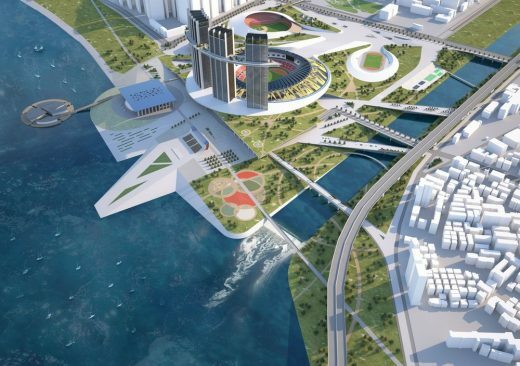 The proposal reconnects Jamsil area to the daily life of the city, tying into the city’s transportation systems and introducing new recreation systems such as bike paths, jogging trails as well as the overlay of transport options like a potential high-speed ferry which will connect parts of the city disconnected by the Han river. Rather than a singular and heavily programmed destination, this proposal is a platform for a multitude of different and more flexible programs and experiences for both tourists and the local community. 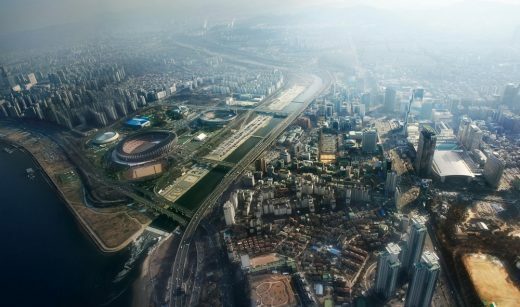 One of the most challenging tasks related with the renovation of the Jamsil Sports Complex, involved combing the new with the old, creating a cluster of the Jamsil Arena and the surrounding area. The primary objective of the design process was to create a complementary dialogue between the intervention and the existing condition, in which the old would be articulated with the new. This process of natural evolution and readjustment begins with the evaluation of the relationship of the Jamsil Arena with its setting. 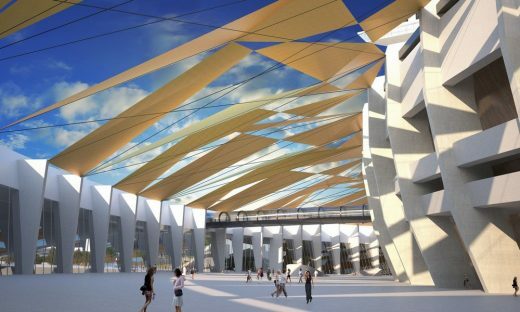 Developed as a circular building surrounding the existing Main Arena, the new commercial, business and recreation facilities, enclose the old protectively and combine themselves with it in an effective way that supports its function. The buildings are as much landscape as architecture. 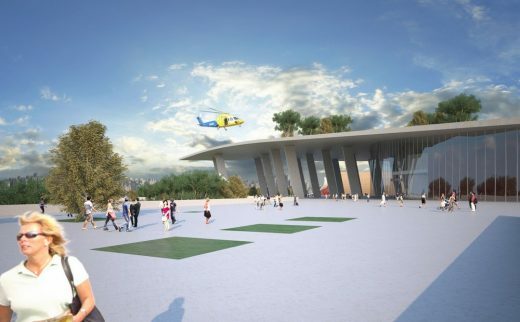 The multi-level intensive green roof and landscaped plazas over the facilities functionally and visually link the elements, and provide a public park and gathering areas. The landscape flows in a natural and progressive way without being forced referring to the principles of the Korean garden. Landscape formations form parts of the buildings volumes connecting the roof gardens with the street level plazas and providing a highly aesthetic, restorative amenity for the users of the complex, and the community at large. The development is envisioned as park-like with picnic areas and green space providing a range of activities and recreational opportunities for visitors and residents of all ages. By placing people at the center of the design rather than vehicles the concept avoids the social fragmentation and lack of “community” in urban areas. Pedestrian options for mobility including cycling, walking and jogging paths are treated as an integral part of the experience. The development provides improved circulation and acts as a connecting link to the surrounding parts of the city utilizing a variety of transportation options. Elevated wide paths in the form of parks cross the Tancheon River improving the connections to the adjacent neighborhood and presenting an opportunity to redevelop the area through an overall strategy based on sustainable urban landscaping. One of the elevated branches of the Olympic road that is going to be transferred underground, instead of being demolished, is converted to a path for both walkers and cyclists and enhances the connectivity with the Bongeunsa, the COEX and KEPCO area.These transformative linear parks create ties with the urban tissue and create the potential for a richly choreographed sequence of experiences for the International Exchange District. An elevated connection with the Asia Park unifies the adjacent green spaces, which otherwise would be disconnected by the wide road and replaces part of the underground passages. The renovation transforms the area into a welcoming and accessible public gathering place and an attractive link to the Commercial and Business neighboring districts. In addition, the project seeks to build a connection beyond its neighbors with its geographic environment. It takes advantage of the slope to render the courtyards dominant over the territory and builds terraces and roof gardens that connect the everyday life of the project with the distant geography. These are places that link leisure time with the surrounding landscape. The project is part of a strong desire to build environmentally sustainable infrastructure, minimizing impact on the environment and insuring high standards of comfort for its occupants. 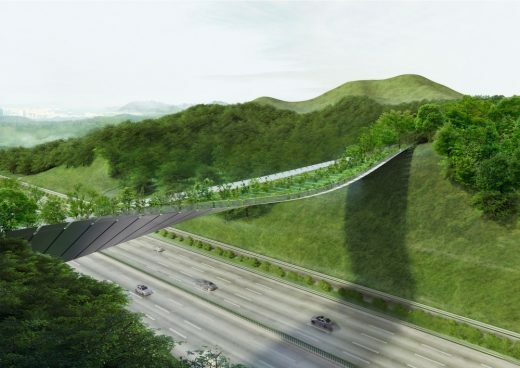 Conceived as an abstract extension and transformation of the land, inspired by the mountains that surround the city of Seoul, the proposed facilities are covered by a series of green interconnected terraces that maximize the public areas. The resulting building programs are a veritable extrusion of the park itself. The design combines all spaces in a creative manner to meet the requirements of the functional program and also allows the massive structures to be integrated on the urban grid with respect to the human scale.